What’s your reaction if on the table in front of you right now served a cup of coffee that is mixed with hot charcoal? In Yogyakarta, one of the most famous and legendary coffee named as Kopi Joss. The name of this coffee also refers to the location for hanging-out, located at Jl. Wongsodirjan on the north’s side of Tugu Railway Station of Yogyakarta. The way how it is being called, the word “Joss” refers to two things that is to describe something nice, delicious and so forth. Also considered as a sound being heard when the red burning charcoal inserted into a cup of coffee that is also still really hot. Yes. You did read it right. 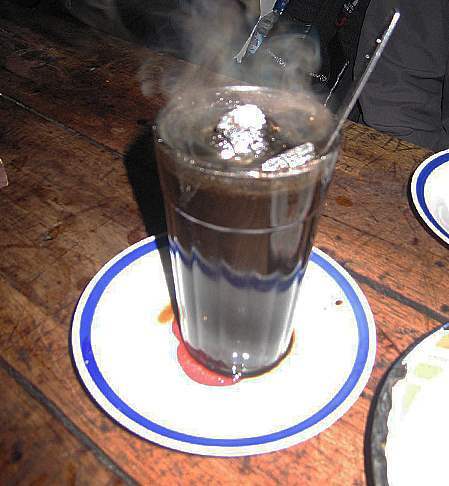 Kopi Joss is a kind of ordinary black coffee which is then inserted or added with one or several hot charcoals. So it is also famous with the name of “Kopi Arang” (Charcoal Coffee) in Indonesia. Sounds weird, not interested or even getting more curious about how does it tastes?! In addition to charcoal, other mixtures combined in a cup of coffee are not many. Simply added with sugar and also milk as you need and if you want it. As simple as that. No more other secret recipes or gradients. Regarding to the charcoal that is used, it was usually the result of burned roots of mangrove plants. In its presentation, boiled water is heated in a small or medium and thin kettle which is also using the stove fueled by charcoal. Not a gas stove to create a distinctive taste. The coffee beans are also departed from coffee plantation located at Klaten which is about 45 minutes from central city of Yogyakarta. The coffee beans are then roasted and then pulverized manually to produce the coffee’s powder. No wonder if when you are finish drinking it, you will be found much of coffee’s grounds on the bottom of glass you use. When the coffee’s powder has been mixed with a spoonful of sugar in a glass, then the hot water in the charcoal furnace was then will be poured into the glass and then stirred. The aroma is very attractive and fragrant, so that could make you want to drink it. And that’s the truth. Immediately, the charcoal that is also heated in the furnace will be taken and then put into the glass. Then ready to be served along with a small placemat as a gutters for the glass. Initially, the placemat will be thought to be useful for the waiter so that the heat does not touch the hands and skin. Indeed it has a point as well. What you might need to know is that a placemat made of ceramic or glass is mainly often used to pour a hot coffee into it so you could drink it calmly, and not getting the coffee too hot to be drinked. The way how to drink a glass of coffee like that, is also a way for Javanese people, especially Jogja, Solo and in other Javanese cities and regencies. So, if you are planning to visit Yogyakarta for your next vacation, make sure to let yourself being served a cup of Kopi Joss at the location that I have informed above.